Today The Tips will hit the stage of the turock - disco, live-club and lounge together with Jaya The Cat! It's their first show of 2015! So - come around have a couple of beers and enjoy the show! After you wake up on Saturday, put on your dancing shoes and go to the Ruhrpott SKA Explosion in Dortmund! The Offenders will share the stage with band like Buster Shuffle Official, Dutch Ska Express and many more. AND we are happy to announce a festival for Lisa & The Lips in summer 2015! Stay tuned for more shows!! 2015 gets better and better - right?! One day left until Atlas Losing Grips new record "CURRENTS" will be released. Make sure you visit your favourite record store tomorrow! Or you check http://hamburgrecords.com/atlaslosinggrip/ to preorder "Currents" in several variants. It is available as CD, Vinyl and even as a limited boxset! Everything looks awesome! Also on this side you can buy tickets for their tour, which starts next week! Remember Rodrigo Alfaro - Official sings all songs on this record - but on tour you will hear the voice of their new singer Niklas Olsson live for the first time. This will be great! See you next week at SO36! 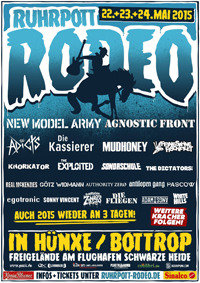 The Ruhrpott Rodeo announced the first round of bands, including The Real McKenzies and The Adicts!! The festival is taking place may 22nd till 24th in Hünxe!! 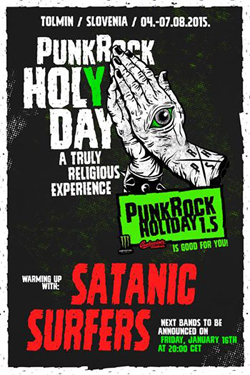 Last night Punk Rock Holiday announced Satanic Surfers as first band on their festival in August! And if you ever been to Punk Rock Holiday you know how special and great this festival is! So get you tickets and make sure to come around! See you in Tolmin! Cheers guys & have a nice week! The Offenders wanna start this 2015 with a solidarity event managed by SV Babelsberg 03 fans in Lindenpark Potsdam! With just 3 € admission you can support the refugees project „Welcome United 03“. The Offenders will be supported by VETO PUNKROCK. 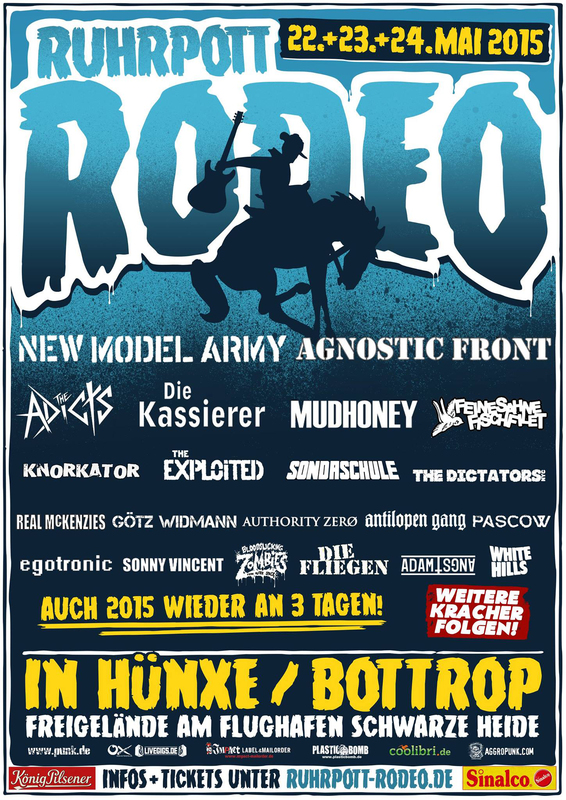 Date: 10.01.2015 - Lindenpark Potsdam! For more news, klick HERE! See you there guys! Happy new year guys! Hope you had a great holiday. We are really looking foward to a year full of awesome music, amazing liveshows & perfect moments! January will be a very good start for this! Tourstart of UK SUBS & Atlas Losing Grip! So check our homepage for all shows & infos! 2015 gets better and better! SATANIC SURFERS will hit the stage at the great GROEZROCK festival in Belgium. & in July the guys will be in france to hit the stage at the XTREME - Scream of Death Fest. Visit their sited for all the infos & the ticketlinks. The lineup of both festival looks awesome!